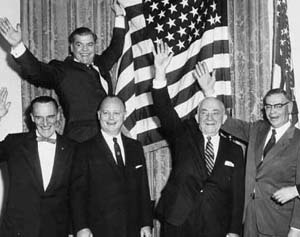 Alaska endured a long struggle for statehood from the time legislation was first introduced in Congress in 1916 until January 3, 1959, when it became the 49th State. Population grew by more than 3% per year, double the national average. Wages and disposable income also grew across all jobs and professions. For the average non-agricultural worker, wages increased 28% from 1961 to 1969. Construction workers earned $11,600 in 1961 and $17,700 in 1969, almost 35% more. Education also improved. Alaskan school enrollment grew from 46,000 in 1958-1959 to 75,500 ten years later. Fewer than 8,000 students attended high school in 1958-59. By the 1968-1969 term, total enrollment had grown to over 18,000. Statehood allowed Alaskans to take control over their fisheries, which suffered under distant bureaucratic control when Alaska was a territory and allowed the salmon population to dwindle from over fishing. Salmon runs improved and crab catches doubled every two years in the 1960s, from less than 20 million pounds in 1959 to over 40 million pounds in 1961, and 80 million in 1963. Today, Alaska’s economy is well established and resilient. Its August unemployment level of 7.8% is slightly lower than the national average. Despite the recent national recession, the State has not experienced double digit unemployment since 1987. Alaska was also one of the healthiest states in terms of mortgage delinquencies throughout the national collapse. Like Hawaii, Alaska’s economic indicators have improved across the board after being admitted as a State. It took a long time for Alaska to achieve statehood, but when it did, the results were quick and dramatic, and they have been enduring.